Asks our friend Kent Hoover while covering a report issued by the National Bureau of Economic Research. 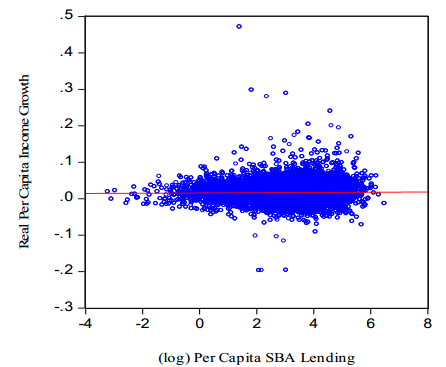 Overall, a 10 percent increase in SBA loans per capita is associated with a cumulative decrease in income growth rates of about 2 percent,” the researchers found. This hit piece is another constant reminder that the industry needs to be ahead of the argument that SBA lending programs pay for themselves and support Main Street to create jobs. Of course, the tax revenue (sales tax by the consumer, payroll tax by the small business owner, income tax by the employee) generated by SBA loan job creation are always ignored in these type of reports. Glancing at the report I already know the fallacies. 1) There was this event called the great recession that will skew all numbers. 2) Comparing urban counties with adjoining rural counties is comparing apples to oranges. Urban economies always trump rural economies. To suggest an increase in Los Angeles county SBA lending is a detriment to Riverside and San Bernardino county economy’s is laughable. Riverside and San Bernardino suffered from the recession and falling real estate values, not from LA county SBA lending. 3) Researchers who issue complex reports with multi-syllable words that no one understands are obfuscating their findings with psycho babble. Their conclusion is political and self-serving.